My partner and I had a dilemma faced by many inner-city dwellers: nice couches in the sitting room- BUT no nice side tables. Where to put the martini glass? On what to perch the canapé plate? Am I right? – everybody faces this dilemma. Space is tight. The couches are expensive and there is NO way that guests are encouraged to rest their drink or antipasto plate on the arms. So- what to do? Enter- the upcycled telephone table. Long in length and thin in width- the perfect dimensions. 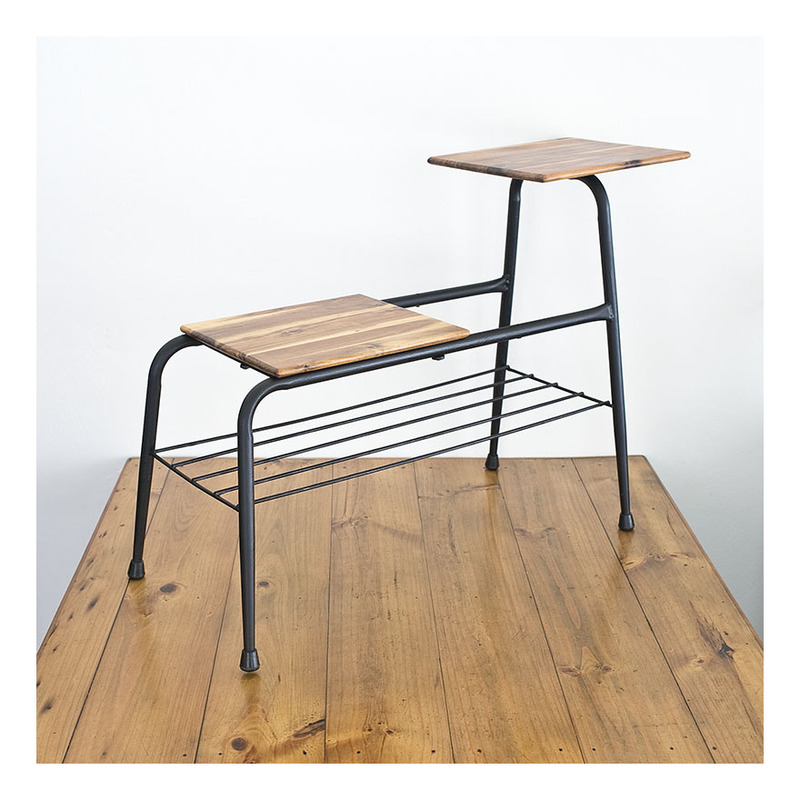 Having an upper and a lower level [once for the telephone and padded seat, respectively]- and with an added grill for the old telephone books – these tubular metal telephone tables are just the thing. Trish stripped back the chrome plating, attended to the rust, and repainted in matt black. Recycled timber was sanded, oiled & finished and screwed to the upper and lower sections and voila- the perfect side table was born. 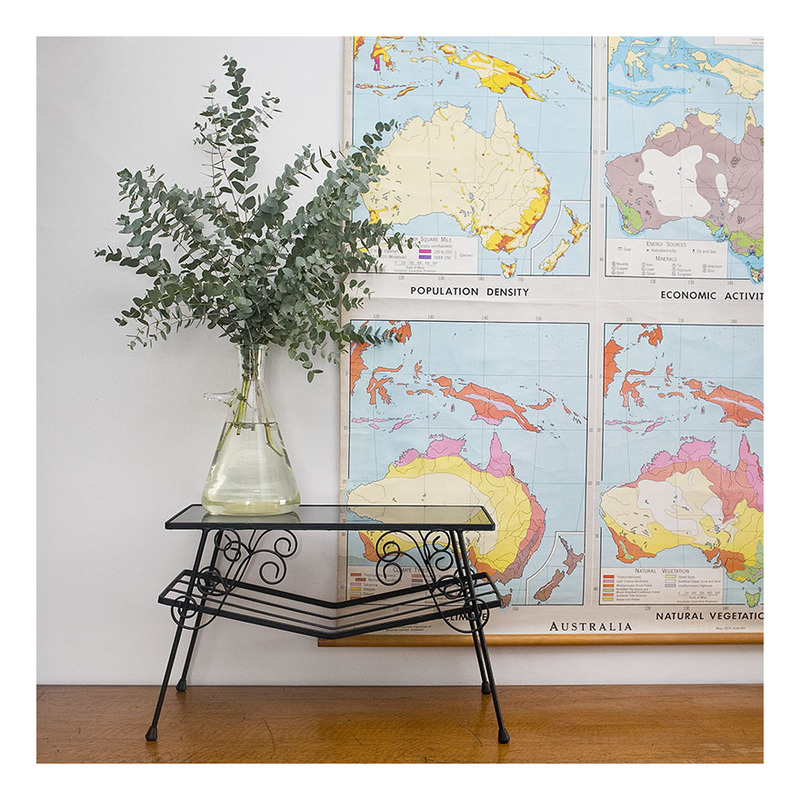 The table ticks all the boxes: upcycling, recycling and retro styling. 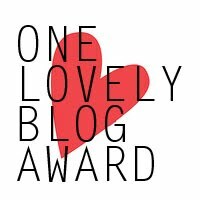 Totally loving it! 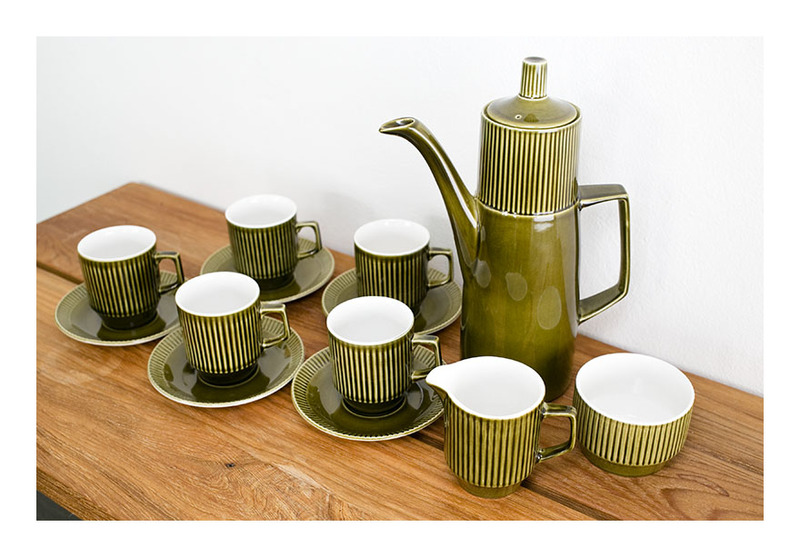 This beautiful set- in de rigueur ‘avocado green’ – a quintessential 60s colour- comprises coffee pot, sugar bowl and creamer, and five espresso cups and saucers. The sugar bowl was always as shown- it didn’t come with a lid- but I suspect there were once six cups and saucers in the set. My attitude is just to pretend it’s a Japanese espresso set- the Japanese favour 5 pieces over six in a set. The British Anchor Pottery Company was established in 1884 and production continued until the 1970s, only stopping for a brief period during the Second World War. I have previously posted British Anchor ‘harlequin’ plates, called Trianon Ware, which were made around the same time as the coffee set, in 1961. This set has stood the test of time- there is no coffee staining to the coffee pot, and only minor internal crazing to the interior of one of the cups. I love the form of the oversized, elongated coffee pot – such a funky 60s shape. Impact indeed! These glasses are ‘swanky swigs’- and they are collected by my partner. Originally the glasses held Kraft products and had a metal lid: then Kraft hit upon the idea of decorating the glasses in a range of themes- so making the glasses collectible. The term ‘swanky swig’ was coined to denote the [obviously] swanky glass from which one swigged! Each design came in six bright colours to form a set; an early innovative use of repurposing. 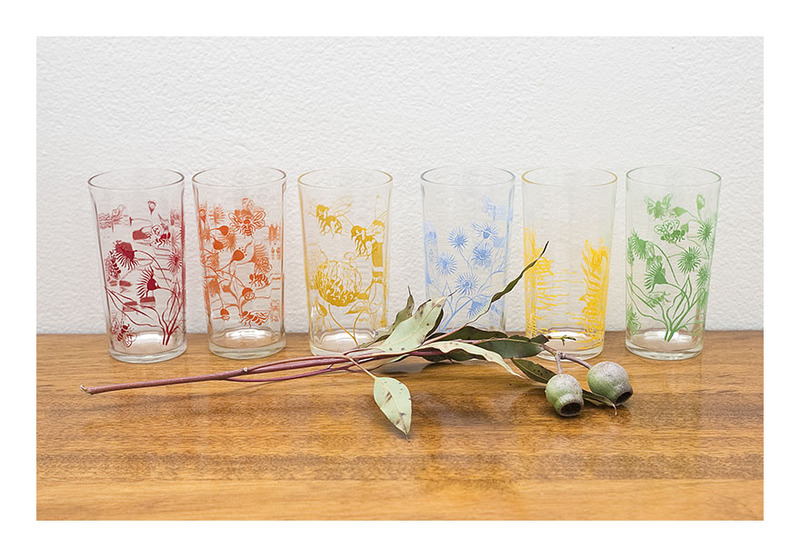 These swanky swigs have a distinctive Australian theme: eucalyptus flowers & gumnuts, and waratahs. They are getting harder to find now- I think because the glasses were considered fairly kitschy when first produced and many glasses were not kept. But for nostalgic collectors- nirvana consists in obtaining a complete set of six. If anyone has the dark blue and yellow gumnut glasses- I need to talk to you! The jug to the right still has its original ‘Waratah’ sticker which proudly proclaims “99% pure aluminium”. It has its measuring scale stamped on the inside – 2 pints or 40 oz. With a black bakelite handle [and lovely expressed mountings] it ticks all the boxes for me! It is relatively pristine and I hazard a guess as to an easy life since it was made. The other two jugs show all the vicissitudes of a hard working kitchen life. The fronts-most jug has a brown bakelite handle, again with those expressed mounts. 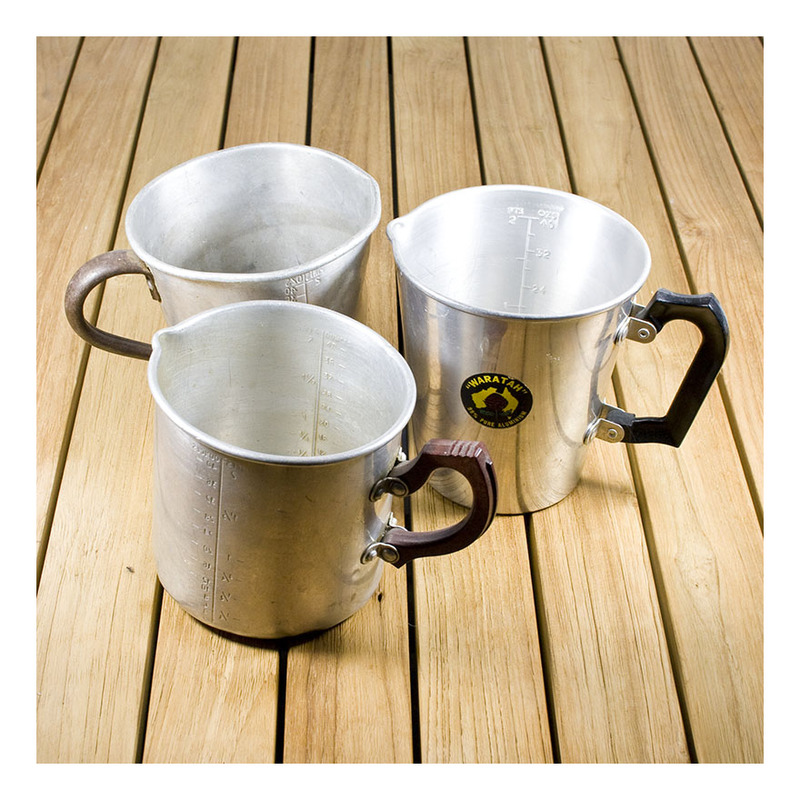 The last jug has a riveted aluminium handle. Both these jugs have the same inside scale as the Waratah, but with more dings and dulling of the aluminium. Evidence of real life! Use the jugs in the kitchen, or as funky vases, or just add them to your collection of 40s jugs. This is my partner’s latest collection- bung jars- so called because a cork lid was ‘bunged’ into the top to seal the jar. Doulton Lambeth made domestic salt glazed stoneware and these date from 1858-1910 as indicated by the markers mark incised in the side of the jar. Also incised is the holding capacity- 3P [pints] – and sometimes the goods stored in the jars. 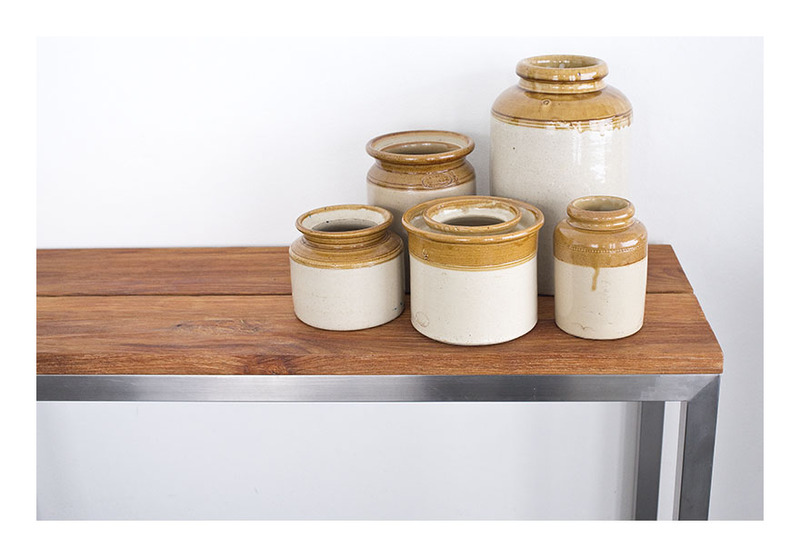 Stoneware is excellent for keeping preserves and has good thermal qualities- so foodstuffs remained stable inside. The jars were never intended to be ornamental, purely functional; you can see the way glaze has been applied- but even so there is a ring of incised decoration to most jars. Most bung jars found nowadays have chips and cracks from their hard life; however we have managed to collected jars without faults. The jars look fantastic massed together, and make great vases [the big one is an excellent umbrella stand.] And –because of the brown tones- I think the jars look great on timber. The cushions are sized to take a 400 x 400mm insert [15.7 x 15.7 inches.] 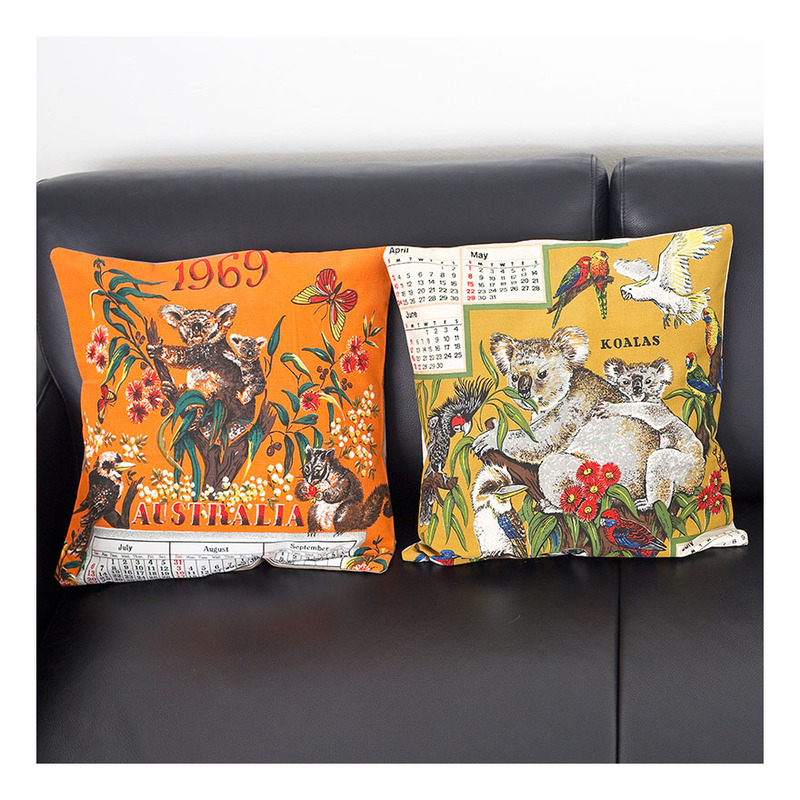 They are fully washable and would make a great gift- especially if the calendar date or state featured has a particular association for someone. I have thirty cushions made- and they can be grouped in 2s or 4s- email me if you’d like to peruse the ‘collection’. The ones here are Australian flora & fauna. Mixing retro objects with contemporary objects is easy- as long as it is done simply. 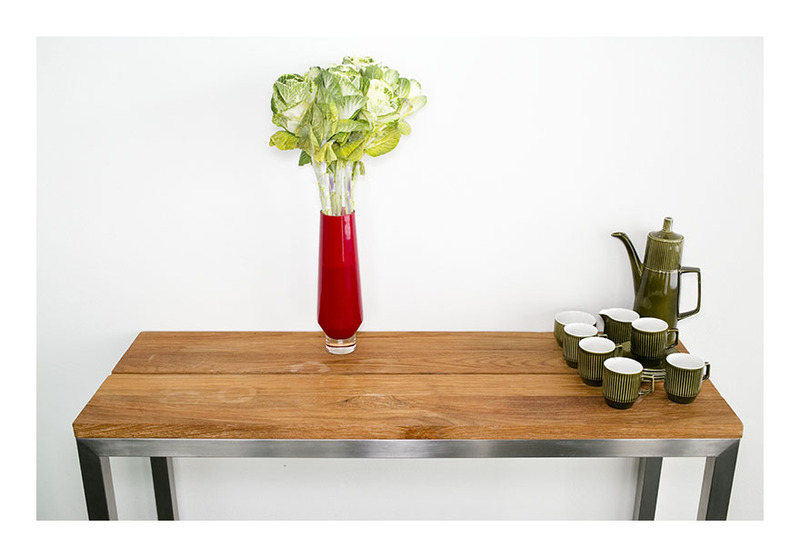 The red glass vase holds kale, an ornamental cabbage. It’s a strong, architectural flower that compliments the modernist lines of the coffee set. Both the coffee pot and the kale have an elongated, exaggerated verticality. And they are green- the complimentary opposite of red. I don’t buy reproduction pieces, but this lovely red glass vase was given to me as a gift. I use it a great deal. I love that it is unpretentious, and plays homage to 60s glassware. It’s robust and honest – a simplified version of the real thing. But wow! does it pack a punch with architectural flowers.